Fly through the air, swing from tree to tree or climb like a monkey! All these activities make up a Zipline or High Ropes experience. There are an ever increasing number of zipline and high ropes centres opening up around Australia. With amazing views and lush rainforests to host these experiences, you'll find them in most states and territories. 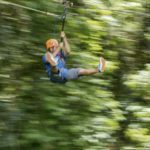 A zipline is a high tensile steel cable stretched between two points, usually trees in a rainforest, high in the canopy. You, the participant are attached to this cable via a harness. You start from a higher point and allow the harness (and yourself with the help of gravity) to "zip" down the cable to a lower point. Ziplines are usually 10–20 metres off the ground and are fun for the whole family with ages starting form 3 years and above. Different to zipline, High Ropes course takes place above the ground, with you moving from point to point along ropes and swings, all the time connected by a safety harness. The feeling is you could fall at any time, the reality is, you are always safely attached to a safety line. Mind games ensure with high ropes, but there is plenty of fun for the whole family to have as well. At the end of high ropes course don't be surprised if you have to zipline down to the ground! Check out our range of zipline tours and high ropes courses below. Book an experience for the whole family or get some friends together for this wonderful outdoor experience.